Or perhaps that headline should read "Thin Lizzy gives writer a chance to wheel out old cliché for headline again"! Whatever, the influential Irish rock and blues ensemble has announced a UK tour, unveiling the recently-hired lead-singer Ricky Warwick - more of that later. Update: tour now features 13 dates! Bearing in mind these are 2011 gigs, they will play dates in Aberdeen (6th January), Glasgow (7th), Newcastle (8th), Leeds (10th), Llandudno (11th), Leicester (12th), Wolverhampton (14th), Manchester (15th), Bristol (16th), Southampton (18th), Ipswich (19th), Cambridge (21st) and finally the Hammersmith Apollo in London on 22nd January. All tickets go on sale Friday 28th May at 9AM and will cost £23.50 regionally, £26 for London, plus the usual fees. Lizzy need very little introduction, such are the size of their rockin' chops, but if you haven't had your emotions tugged by the rather anthemic "Whiskey in the Jar", "Dancing in the Moonlight" or "Sarah", or given your neck-muscles some exercise to "The Boys are Back in Town" or "Waiting for an Alibi", then you have clearly been living on Neptune. How's the weather up there by the way? New addition to the line-up is none other than Ricky Warwick. 'Who is he?, I hear you enquire. Lead singer of The Almighty, guitarist for New Model Army and a member of Circus Diablo (with The Cult's Billy Duffy), he certainly has some stripes, rock-wise. 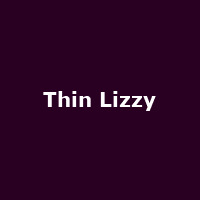 Add in original drummer Brian Downey and early guitarist Scott Gorman and you have as authentic a Lizzy line-up as you could wish to have (given the obvious sad lack of Lynott and the unlikely return of Moore and White to the fold). Should be a good night (or thirteen).